County Executive Ike Leggett calls the new garage at the Glenmont Metro a "boon to transit and a boon to the environment." A truly "green" garage at a transit station would make room for people, not just cars. Last week, Montgomery County officials cut the ribbon on the new parking facility, located on the west side of Georgia Avenue at Glenallan Avenue. A press release notes that the garage, which earned LEED certification, was built from recycled materials and has energy-efficient light fixtures. Meanwhile, WMATA cut down an acre of trees to build the 1,200 space, 80-foot high garage while violating the county's own plans for transit-oriented development. Is there such a thing as a "green" parking garage? Maybe if it's covered in plants, like this one in Miami Beach, Florida. While there's nothing wrong with accommodating drivers who'd otherwise drive all the way to work, just building more parking spaces won't help the environment - or Glenmont, for that matter. 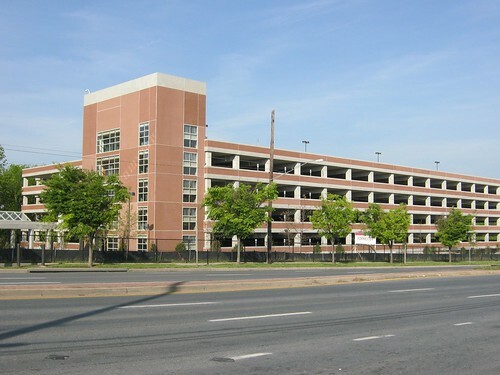 In 2006, WMATA proposed building a new parking garage on 10 acres of land they own along the west side of Georgia Avenue. The existing 1,700-space garage fills up often, they claimed. Neighbors didn't want a garage in their backyards, and county planners agreed, suggesting that it be built on the east side next to the old one. WMATA's design required tearing down an acre of forest the county wanted to preserve, but the Planning Board reluctantly approved it, arguing that sending them back to the drawing board would be a waste of time and public funds. Nonetheless, then-Chairman Royce Hanson called the garage "both an injury and an insult to the neighborhood." The county and state of Maryland spent $24.7 million building this garage, or $20,312 a space. Not only did they spend more than originally planned, but they've wasted an opportunity to do the "green" thing: create revenue-generating, neighborhood-compatible development along Georgia Avenue. In a presentation at Rail~Volution last fall, Jason Schrieber, principal at planning firm Nelson\Nygaard, noted that transit stations in town centers often have more riders than those served only by park-and-rides. In addition, placing other uses around transit creates both economic and public safety benefits for the surrounding community. With about 5,800 riders each weekday in 2010, the Glenmont Metro station actually has more customers than neighboring Wheaton, which is in a town center. But it still pales in comparison to other Red Line stations in downtowns, like Bethesda (10,600) or Silver Spring (13,400). Meanwhile, just 17% of people living within a half-mile of Glenmont take the Metro to work, compared to 35% in Silver Spring. These are people who probably wouldn't drive to the station, so a new parking garage won't encourage them to use transit. 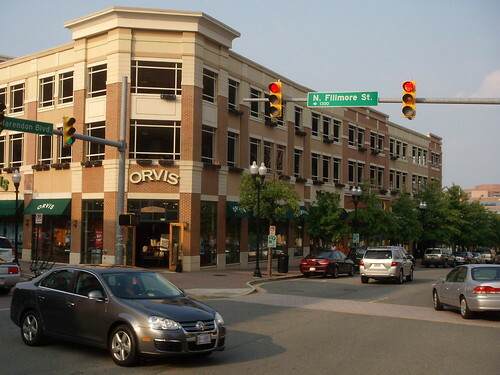 Though Glenmont struggles with disinvestment, it's one of the few Metro station areas in Montgomery County where private development is happening without public subsidies. After years of delays, local developer JBG is finally moving forward with Glenmont Metrocenter, which will turn a 1960's-era apartment complex into a mixed-use community with 1500 homes and 90,000 square feet of retail without a single dollar of county funds. 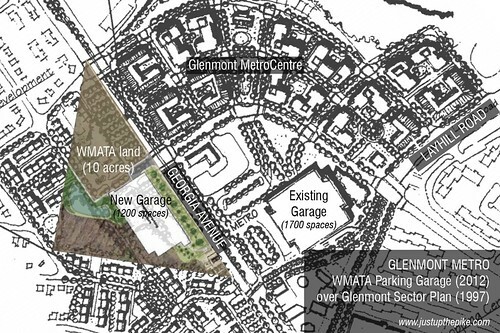 WMATA could have made money by selling the land around their new garage for future development from which the county could receive tax revenue. Meanwhile, the neighborhood would have more amenities, more residents or workers who could walk or bike to the Metro, and more "eyes on the street," making the area safer. County planners are beginning to revise the 1997 plan for Glenmont, but a large chunk of the neighborhood's potential for revitalization is now be gone. There's only so much land next to Metro stations in Montgomery County and Greater Washington as a whole, and we have to use it wisely. 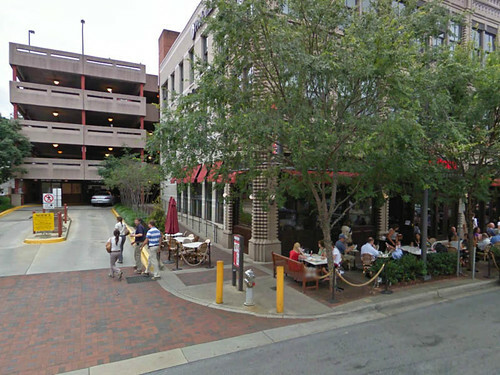 Other than by permitting construction on the greenway strip along Georgia Avenue (a legitimate idea), I don't see how a mixed use development could have been added to the garage site. The concept of child care centers at Metro stops has often been talked about, but doesn't seem to have caught on. The best redevelopment option is probably for a developer to assemble plots for townhouse or small/medium scale condo projects from the single family houses nearest the station. The center of area retail should stay the corner of Georgia and Randolph. Modest goals are probably best. Glenmont isn't going to be Bethesda, or even Olney, and the amount of retail space in the east county is probably sufficient. Each square foot built is probably a vacancy somewhere else. Good piece. And glad to hear the JBG project is back on potentially, despite the NIMBYs efforts to kill it. I know nothing about actual user data for the Glenmont garages. That said, I assume that this was mostly a new amenity for Olney, not Glenmont. This is a garage for exurbanites who drive to Metro at Glenmont and then head downtown for work where parking is prohibitively expensive. When looked at this way the considerations never had anything to do with Glenmont or the immediate area. Glenmont is extremely ugly, always has been and always will be. This garage just makes it even uglier. Doesn't seem like the transit center at silver spring station is faring any better.